OCEANFRONT LUXURY HOME - JUST REDUCED! EXCELLENT OPPORTUNITY TO BUY AN 5 BEDROOM / 3.5 BATH OCEANFRONT BEACH HOUSE WITH STAINLESS STEEL APPLIANCES, THREE STOP ELEVATOR, PRIVATE WALKOVER TO BEACH WITH OUTSIDE SHOWER, OCEANFRONT COVERED PORCHES, OCEANFRONT SUNDECKS, TWO OCEANFRONT MASTER SUITES, ADDITIONAL SITTING AREA ON 2ND FLOOR FRONT AN BACK, FULLY FURNISHED. UNTIL LAST YEAAR, THIS HOUSE HAS NEVER BEEN ON A RENTAL PROGRAM AND IS ONLY USED AS A SECOND HOME BY THE FAMILY. 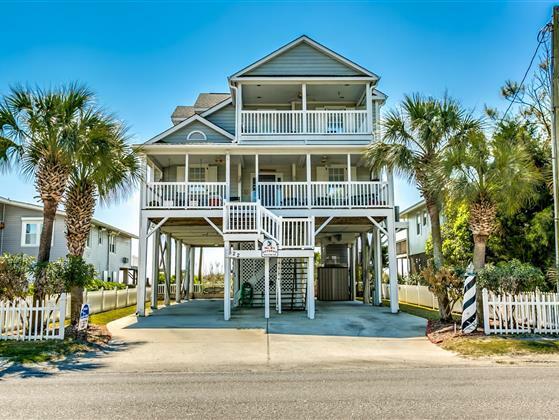 ONE OF THE BEST LOTS IN GARDEN CITY WITH MULTIPLE 6' PLUS DUNES PROTECTING THE PROPERTY!